It was a new look Annan team which kicked off the first of their Betfred Cup matches with a game against First Division neighbours Stranraer at Galabank on Saturday and with only three of last season’s team starting the match, Blair Currie, Steven Swinglehurst and Barry Cuddihy, Annan were very much going into the unknown against the Division One team. Stranraer deservidly won the points with a polished second half performance after the teams were deadlocked in a goalless first half where chances were few and far between, with neither keeper being seriously tested. There were few goalmouth incidents to talk about in a first half where both defences looking solid with neither keeper being really tested. Annan’s Max Wright’s 30th minute cross in front of the goal was well intended but nobody read the intent and a promising opportunity was lost. 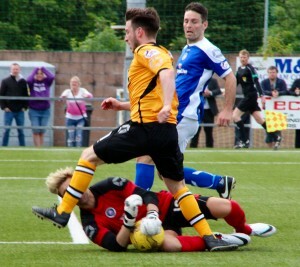 Minutes later Cuddihy’s corner had Annan claiming for a penalty brushed aside by the referee. Annan were dealt a blow when Sharkey had to leave the field injured to be replaced by Norman. As the game approached half time Craig Malcom worked his way into a good position but his shot failed to hit the target. Staranraer’s best chance fell to Willie Gibson when he failed to hit the target with a free kick on the edge of the box. Stranraer started the second half where they left off in the first with Gibson rifling another free kick over the bar. Minutes later Cuddihy made a good run from the middle of the park but the finish from 16 yards was did not match his penetrating run. Annan were threatening and a minute later a spectacular 18 yard shot from David McKenna struck the cross bar with the keeper beaten. Christian Nade was introduced in the 57th minute for Kemp and within minutes he put the visitors ahead when he connected at the near post with a low cross from Scott Agnew. It was a well worked goal and marked the start of a period of sustained pressure form Stranraer. Nade came close in the 67th minute with a spectacular shot from 18 yards which flashed over the bar. Stranraer doubled their lead in the 75th minute and it came via a corner kick when Frank McKeown headed into the net it was an opportune moment made all the more easier with Swinglehurst having to temporarily leave the field of play due to injury . Annan brought on Dachnowicz and Park for Ribeiro and McKenna and the subs gave Annan a lift and they pulled a goal back in the 85th minute when Cuddihy’s through ball unlocked the Stranraer defence and Przemyslaw Dachnowicz nipped in to prod the ball past Max Currie. Annan all of a sudden looked dangerous and Max Wright was thwarted by an important save when Swinglehurst put the striker through one on one. Stranraer overall deserved the victory and for Annan boss Jim Chapman there was enough positives that he could take from the game as he attempts to rebuild a new Annan team. Annan Athletic – B Currie, J G Lucas, S Sharkey (S Norman 35 min), A Asghar, S Swinglehurst, R Krissian, W Robertson, B Cuddihy, D McKenna (P Dachnowicz 72 min), M Wright, T Ribeiro ( L Park 72 min). Subs Not Used A Mitchell, C Liddell, B Jaekel, L Gibson.